RJW76 wrote: Is it true that as far as pricing goes, it's best to wait until Jan/Feb? Someone told me this because the new stuff comes out in Mar/Apr so there's a lot of closeouts. yes, IF, and I really mean IF, you can find what you're looking for and/or aren't opposed to buying a floor model. by Valentines Day last year it looked like we were running a going out of business sale (Super Bowl being in Pittsburgh didn't help). they quit making them right around Christmas, and then announce the new models at the beginning on January at the Consumer Electronics Show. The new models trickle into stores from late February thru June, with the highest end ones typically becoming available in the late summer. which also makes February-May some of the worst times to buy, since they don't get discounted much around then. In my opinion the two best sales in terms of prices and other promotions (free gift cards, interest free, % savings on charge card) were the week leading up to Fathers Day and Labor Day week. Pittsoccer -- thanks alot for answering all the questions. - Still considering Samsung UN55D6000S which is on bestbuy.com with a free bluray player (that I don't need) for $1398. - Now considering 3D tvs, the LG 55LW5600 ($1438.99 includes 12 pairs of 3d glasses) and the Samsung UN55D6420U (2 pairs of 3d glasses or a blu ray). 1. 3D is now something I am heavily looking at since I just found out that the channels are free on comcast and that next year's olympics will be broadcast in 3d on comcast's own 3d channels. I have only watched 3d when i am in a best buy....aka not a lot. What is your take on 3d? Is it worth it now? I hear that technology is moving away from TVs that require glasses and towards TVs that are 3d but do not require glasses. How far away is this technology and would you, as a sports fan, recommend 3d or is it too cumbersome and not cool enough to warrant buying a tv just to watch the occasional game in 3d and most importantly our soccer teams next year as well as other olympic events. I honestly don't care about 3d movies other than the newest Harry Potter movie and I have already seen that in 3d in theatres...so I'm basing my desires solely on sports at this point, I believe. 2. A guy at Best Buy i spoke with today was super helpful and told me that while the samsung that I like is good and very popular, his personal favorite, and part of a great bundle this week is the LG 55LW5600. It has built in wi-fi which is nice, the magic motion remote, and comes with 12 (unreal) sets of 3d glasses this week ($1438.99). I have no knowledge about LG TVs and like I said, am kinda hell bent on Samsung, unless this is a deal that can't be ignored. What are your thoughts on LG tvs in general, and specifically this model? Later in the day, I went to Sam's Club and they had the LG 55LW5700 for $1397. Based on the model #, am I to actually believe that this tv is a higher (better) model than the one the guy at best buy recommended to me? THe price seems unreal compared to best buy. What gives? 3. What are your thoughts on the Samsung UN55D6000S vs the UN55D6420U (~$1800). Apparently both will come with a free blu ray. Again, I don't need one, but I guess I could sell it....unless the 3d model came with a 3d blu ray, which I don't have. THe UN55D6420U looks like it also has the option of coming with 2 pairs of 3d glasses instead of the blu ray, again at the $1799 price point. I heard conflicting reports that the more expensive model (UN55D6420U) will not swivel on its stand, which is kind of bothersome. It says it can on the specs on the best buy site, but the guy in the second best buy i went to was vehement in saying it will not swivel, which to be honest, is a deal breaker. MOre importantly, this is going to be the decision once I find out if 3D is a must have or not. What are your thoughts on these two TVs and the $300 price difference between them. Is it worth it to stick with Samsung, a brand i have really enjoyed, albeit at a steeper price when considering 3d vs 3d. Or should I not let this LG deal pass? Also, how are the apps and specifically netflix on the LG? I like how my apps currently work on my samsung...nice menus, etc. I'm not asking because menus confuse me (I'm still on the upswing of the learning curve at 25, haha), I just like how sharp mine look. Any help would be appreciated! Thanks so much again! Just saw this on best buy's site: Sony KDL55EX723 for $1599. How does this compare? What is Sony like in the 3D world? This is another wrench thrown into this decision as I didn't even look at any Sony's today as I figured they would be out of my price range. Also what about their apps? Netflix and pandora, etc? -The UN55D6420 is just Best Buy's version of the D6400. No differences. -The LG LW5700 is a LESSER tv than the LW5600. The 5600 is the common one, the 5700 is for clubs/warehouses and has a lower contrast. Now we're talking 3D. There is so many different ways to do 3D, and each technology has a lot of pros and cons. There are different types of screens, glasses, lighting, and even ways of fitting both the left eye image and right eye image onto the screen at once. Rather than me try to explain everything to you I'll give you two good links. I can answer any additional questions you have, but 3D is still a new and unsettled technology so it's hard to explain all of them at one shot. The move all the manufacturers want to make is towards no glasses, but there is still no good way to send the correct image to the correct eye, especially when viewers are sitting at different spots in the room. The major difference in 3D sets is what kind of glasses they use - active shutter lcd glasses or passive polarized glasses (like the movie theater). Both have pros and cons. Active was out first and has received the most development. Passive really only has two companies making it now - Vizio was first and LG has really picked up the torch and ran with it this year. Currently, all the premium tv sets use active shutter glasses. Depending on the source, it allows each eye to see 1080p lines or resolution. The LG set you mention has a film on the screen that polarizes each line of pixels, essentially sending each eye 540p. Allegedly with a new firmware update you can get 1080p to each eye by turning off their TruMotion effect, but I have no got to play with it enough. Beyond that alot of the 3D content (video games, 3DTV) is not in true high definition. ESPN 3D will only send you 360p lines of resolution to each eye. Sports are really cool in 3D, but it is a much more subjective experience. The Samsung glasses now sell for about $30 each and require a watch battery. The LG ones are the same sort you get at the movie theater and are only a few dollars each. Passive has less crosstalk between the two images and is a bit brighter, but this comes at the cost of contrast and HD quality. I've only had access to an LG Cinema 3D set for a few weeks so I am not the best judge of it's quality, especially in 2D. We've had their demo loop or Avatar on it in 3D nonstop. The D6400 however has an excellent 2D picture. CNet rated it's 3D picture better than the W5600 and also Panasonic's entry 3D plasma the ST30. Thats their variant of the EX720, which I said in my innital post was being priced vary aggressively this year. It would compete closely with the D6400. It is a nice tv, I don't think Sony has as many internet apps. The two you mention you use they have, they even have a Netflix button on their new remotes. Sony has been pricing very aggressively because I think they see their market dominance being eaten away by Samsung and to a lesser extent LG, Sharp, Vizio, and Toshiba. Spec for spec almost every week last year the Samsung tv would be 10% cheaper and of at least an equal if not better picture and usually more features. If you're really starting to let 3D enter your mind I would definitely urge you to look into the Panasonic GT30 plasma. It falls into roughly the same price frame you are looking at. I think that tv is superior to all the others you've mention in almost all regards, especially 3D. Due to plasma's 600hz refresh rate they don't have to display blank black frames in 3D, which gives it a more natural appearance. for a cheap model that would last me 2-3 years? Westinghouse (and RCA, Sylvania, Element, Magnavox, many others) are not manufacturers anymore. They are brand names that cheap Chinese/Taiwanese manufacturers license to stick on their products. After all, if you're looking for a new set you've heard of RCA, but probably have not heard of Hisense. Theres a very good chance Hisense made that television, but it caught your eye because you know RCA. RCA's licensing is so screwed up that DVD players that say RCA and tv's that say RCA probably aren't even made by the same company. It isn't to knock any of them - I have a 37" Element tv in my bedroom and even after staring at $2000+ tv's all evening I still think mine looks pretty good on the wall. I'd really want to look at both of them. That Samsung is at the low end of their lineup picture quality wise. It's still a nice picture and you're getting 50" of it. Youre still getting Samsung quality in the build. You can't be sure of what kind of quality you're getting with Westinghouse (since you really have no idea who made it). If you intend to jump head first into bluray then I might recommend the Westinghouse. If most of your tv watching will be televised sports, the plasma might be better. I'd also ask you what you'd really like to purchase in three years, and what you'd do with the one youre buying now. I did find out the big boxes will be getting a 46" 1080/120 led by one of the major brands (that I don't think I can name yet) and it will be priced very aggressively for black friday-christmas. I'm just speculating on price, but I can imagine it being as low as $700. Wow, thanks. I had no idea about that re: branding. I figured RCA made, well, RCA. I really am leaning towards the Samsung. I realize that im not giving you much to work with and may be thinking cheap, but it's what i can afford. I could go smaller I guess (40") but that 51" plasma is tempting. I will be watching mostly sports programming, not bluray. Vizio is very similar in a branding sense. They are a marketing company, not an electronics manufacturer. They will come up with a specification what they want on the tv and then have factories bid to produce it. It's not an off brand to Sony or LG or anyone else. The tv's might be contract manufactured by them, or include a Sharp LCD panel (Sharp makes panels for tons of LCD tvs) or a Samsung tuner, but they aren't produced singularly by any other company. Conversely Samsung dumps around 30% of their profits into R&D trying to figure out what features customers really want. For example this is where they got their edgeless led's from. The research? 80% of household major purchase decisions are made by women/wives (from what I've observed it's probably true). So they really sought to come up with a tv that looked attractive just sitting there. DLP sales for them were hurt because women don't typically want big ugly 65" boxes in their living rooms where they want to impress guests. Last year that had to be the #1 thing that kept people from buying Sharp Quattron LED - their bezel was this big rounded chrome thing and plenty of people thought it was ugly without even looking at what was on screen. Men on the other hand want the biggest tv they can cram into a space. By making the bezel as small as possible you can fit more screen size into a given space. pittsoccer33 wrote: The research? 80% of household major purchase decisions are made by women/wives (from what I've observed it's probably true). So they really sought to come up with a tv that looked attractive just sitting there. DLP sales for them were hurt because women don't typically want big ugly 65" boxes in their living rooms where they want to impress guests. Last year that had to be the #1 thing that kept people from buying Sharp Quattron LED - their bezel was this big rounded chrome thing and plenty of people thought it was ugly without even looking at what was on screen. My Samsung 61" DLP is awesome, it's a beast, but the cost for DLP couldn't be beat at the time. It's too bad that they dropped the DLP technology. I think Mitsubishi is the only one left making them and when you can get a 73" tv for around $1000 and it has all the features a $3000 tv does, can't go wrong. What are your thoughts on the Rear Proj. DLP tvs? The 73" Mitsubishi is around $1500. With it you get internet connectivity and 3D. The 70" Sharp is almost twice that. No 3D. I would most recommend one to somebody who is thinking about a projector for a room that has little ambient light. The most comparable projector is the Optoma HD33 for $1500. And with that you are going to have to buy the projector mount, lots of extra [long] wires, a screen, and a sound system - not to mention worrying about projector issues like throw distance and all the wiring and mounting required. Worth doing if you want to invest in a theater room but not as plug and play as a delivered tv would be. I've been toying with the idea of getting a projector for my movie room, but I really don't know if it would be the right type of room. The one good thing is it does not get a lot of outside light. If I would give you some measurements, do you know much about the setup for projectors that you could give me some tips and if it would be worth it to invest? eddy, canaan is totes magotes the projecter guru on this board. not that PS33 doesnt know his stuff either. but canaan could def help you. My ceiling height is just under 7' (82"). From the front of my tv to the back of the couch is 12'. 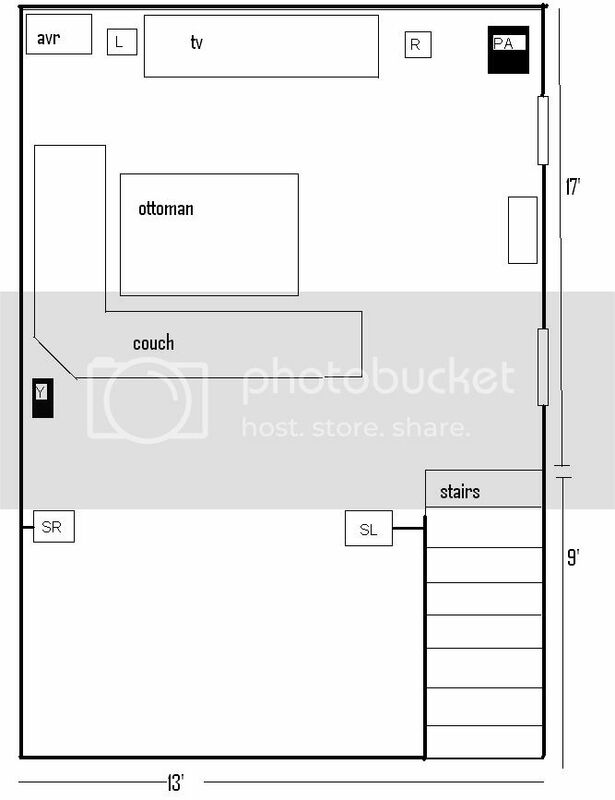 My plan would be to get a pull down screen in front of the tv and mount/position a projector behind the couch. it's a low ceiling, so I'm not sure how that would change screen size? These are the things I have no idea about. Check out setup below for better idea. What size screen could I get, would this work? Hey pittsoccer: Do you know of any TVs that allow you to manually change the screen size (like a desktop, screen)? That, the Optoma HD3300 (higher quality) or HD20 (if you don't care about 3D) are some of the best entry level home theater quality projectors. The next price point would be closer to $3k, then $5k, etc. I love your couch set-up, eddy. I want a "U" shape around my tv. Physical_Graffiti wrote: Hey pittsoccer: Do you know of any TVs that allow you to manually change the screen size (like a desktop, screen)? not sure I totally understand. Most TV's are set to overscan the video signal they are sent. That simply means they zoom in on the image just a tiny bit to cut out the edges of the picture. they do this because often times the edge of the video is full of fuzz and visual noise. you will notice that fuzz especially on a youtube video that was obviously captured from VHS. if you plug a PC into a television you will typically see that the desktop has been zoomed so that the taskbar no longer fits on the screen. on my Panasonic tv the setting I need to enable is HD2 under Picture-->Advanced-->Screen Size. Some manufacturers will call it overscan control, some will call it 1:1 pixel mapping. you definitely want this enabled on a bluray player or gaming console. usually when you are changing the "screen size" beyond this adjustment you are doing it at the video source, and it involves changing the resolution of the signal being sent. if I didnt answer what youre looking for let me know what gadgets youve got and exactly what youre trying to do. Specifically I'm referring to my 64 inch LCD Hitachi: The image on the TV isn't always the right size (for example, when watching TSN, the score of a game can appear offscreen) regardless of whether I have the screen aspect ratio at 16:9 or 4:3. Are there TVs in which I can manually fix this? Can I do that on this TV? Is it because of the satellite signal ( I don't think it is, because it isn't a problem on every channel)? this sounds like overscan to me - you wouldnt be as likely to notice it on a channel that that doesnt have an image around the edge that you are looking for. my first thought is that there could be a zoom, stretch, autofill, or overscan related setting on the satellite box that could be changed. the tv probably has a geometry control knob on the back that would also help, but id be afraid to touch this without knowing what exactly to do. almost all newer tv's have custom zoom options, but I don't know of any offhand that do exactly what youre looking for. pittsoccer33 wrote: this sounds like overscan to me - you wouldnt be as likely to notice it on a channel that that doesnt have an image around the edge that you are looking for. Thanks, I'm still confused as to looking at this. I will definitely look into those projectors, but I'm not getting the screen part. From my numbers what screen size could I get? Would it max out somewhere, is one more ideal than the other for that room? The couch is about 8 feet away from the TV, if that helps at all. optoma's calculator has some better info on it. click on that link and go to the distance calculator. you can hover over any of the text boxes for info on exactly what youre measuring. 2) the distance from middle of the projector lense to the top of the screen. the bigger the screen the further down from the ceiling the projector has to sit. -the top of a 16x9 image will be 6.6" down from the middle of the projector. in that case for now we'll just estimate that the screen starts 18" down from the ceiling (this can be adjusted by the projector mount). -the screen will be 41" high. it will start 18" down from the ceiling and 23" up from the floor. -it will be 73" wide, giving you an 84" diagonal screen size. just by eyeballing the numbers, you could hang it between 10-14 feet from the wall/screen and have between an 84"-120" screen. you'll have to figure out exactly how large of a screen you would want on your wall, how low/high you want it to sit, and work from there. either 720p or 1080i, which ever you think looks better (probably 720p). additionally, you should set your television provider's set top box to match that. on my bedroom tv I have it at 720p. pittsoccer33 wrote: just by eyeballing the numbers, you could hang it between 10-14 feet from the wall/screen and have between an 84"-120" screen. you'll have to figure out exactly how large of a screen you would want on your wall, how low/high you want it to sit, and work from there. much thanks, now the hard part... the wife... bigger screens will be good for the little kids because their eyes are so small and weak, right?